FC Halifax Town sealed their return to the Conference Premier five years after they were demoted from it with a 1-0 win over Brackley in the Blue Square North play-off final. Lee Gregory was the man who got to have his name up in lights when he prodded in Town’s winner with 15 minutes remaining. In a final where one goal was always likely to decide the outcome, Gregory’s close range finish was enough to earn Town a deserved win as they produced one last mammoth effort to push themselves over the finish line. Look up ‘cagey’ in the dictionary next year, and you’ll probably find this fixture underneath the word. There wasn’t a great deal to jangle the nerves of either set of supporters, but every ball into the box and carefully-measured back-pass was enough to set the hearts racing. But the day will feel like Christmas morning and fireworks night rolled into one for the travelling 1,000 Shaymen fans who crammed into one end of St James’ Park. The journey down to Brackley was also a trip down memory lane for those travelling Shaymen, passing the likes of Matlock, Worksop and Retford which their team have graced on their ascent through the leagues. Town fans could only hope they were leaving them behind for good as they edged further towards Brackley and possibly dining at non-league football’s top table once again. Neil Aspin kept the same side that started the semi-final, second-leg at Guiseley, while Chris Worsley failed to recover in time from his ankle injury to feature. Dan Gardner, who arguably could have been playing at a higher level next season whatever the result, started in determined mood and looked keen to take Town there all by himself as he jinked past two challenges before his left-foot shot flashed just wide of the far post. But that was the closest either side would come for a while as both teams struggled to assume superiority against two well organised defences. However, Gardner remained the man who appeared likeliest to make something happen as he proved a thorn in Brackley’s right side with some dangerous bursts. Perhaps because of the paucity of chances being created, Gardner had a punt from nearly 30 yards out on the half volley after flicking the ball away from a challenge, only for the ball to fizz narrowly wide. Brackley offered little threat of their own, with target man Jefferson Louis’ threat nullified effectively by Liam Hogan, who had a weak penalty appeal against him rejected after a coming together with Gary Mulligan. One hand was easily enough to count the chances created though as the most important game of the season failed to catch fire in dreadful conditions. The rain teemed down as the second-half got underway, as the conditions also asked which of the two teams really wanted a place in the Conference Premier next season. The two league meetings between the clubs this season turned out to be incredibly prophetic as barely a sheet of A4 could be squeezed between them. 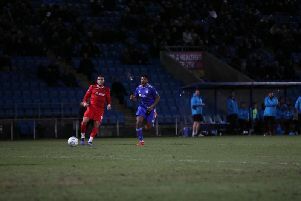 But the contest did begin to open up as the second-half wore on, with Sean Williams finding space in the box before his shot was blocked, while Lee Gregory and Alex Johnson both saw shots dribble off target. Just as the game seemed to be drifting towards an unbearable further 30 minutes of tension, Lee Gregory suddenly erased the extra-time that appeared to be etched across the game as he fired Town ahead with 15 minutes remaining. Gardner, unsurprisingly, made it happen as he produced a lovely one-two with Williams before evading a challenge and firing towards goal before Turley’s save was lashed into the net by Gregory in front of the now ecstatic away supporters. Of course, the drama didn’t end there as Matt Glennon had more than enough time to share in the limelight as he produced an outstanding save to tip wide a goalbound shot from the edge of the area. From the resulting corner, the ball was headed inches wide as Brackley came agonisingly close to spoiling the party. But the moment Town fans had waited five years for finally came after four minutes of added time when the referee’s whistle signalled the conclusion of their climb back up to the top rung of the non-league ladder. Brackley: Turley, Mulligan (Diggin 79), McDonald, Odhiambo (Story 86), Sharpe, Austin, Reid, Solkhon, Walker, Louis (Robinson 79), Winters. Subs not used: Nisevic, Walker. Halifax: Glennon, Toulson (Bolton 46), McManus, Hogan, Pearson, Lowe, Needham, Williams, Johnson (Moke 73), Gardner, Gregory. Subs not used: Senior, Worthington, Seddon.